Relate: There is a bit of debate as to what exactly ISIL believes. They call themselves salafis. Basically that is an ultra fundamentalist movement to try and restore Islam to what it was in the first three generations. It should be noted that more than a fifth of those in Saudi Arabia view themselves as salafist and all twelve of the judges on ISIL’s kangaroo court are Saudi. Salafi detractors of ISIL call them wahhabi. Wahhabism is similar to salafism except it has a much more political and iconoclastic bent. ISIL’s destruction of certain muslim “saints” tombs fit nicely in line. Also, wahhabism is considered by many to be a derogatory term for salafis with delusions of grandeur. Declaring themselves a new caliphate and demanding all Muslims world over to recognize the spiritual authority of ISIL’s leader, Abu Bakr al-Badgdadi, might possibly be considered delusions of grandeur. It was also the one act that motivated many other Muslim leaders to finally condemn ISIS. Apparently, they didn’t want to do so until their own authority was in question. There are also those who claim ISIL are actually Khawarij. That is basically the Muslim version of “cult” or “apostate”, but it comes from a group way back in the seventh century who rejected the current caliph’s authority and emigrated into what is now southern and western Iraq. They are most noted for their belief that all who claimed to be Muslim but did not agree with them were deserving of death… sound familiar? No matter what else is said, one thing even their strongest detractors would agree on, is that ISIS is passionate in their beliefs. No matter how warped and twisted those beliefs might be, they have demonstrated over and over again a willingness to kill and to die for them. When they murder the Shiite, when they kill the Kurd, when they execute the Christian, they truly do believe they are doing a holy service to God. Most of those interviewed now living as refugees in Baghdad or in the Kurdish capital, Irbil, claim they have no intention of returning to their homes. They are making the journey that over a million of their friends and neighbors made before them. The question is, if all the salt has left or is leaving, what will stop the decay from growing? If all the light is gone, why do we wonder if darkness reigns? ISIS will not be beat by guns and bombs. Darkness only truly flees when light returns. God, I pray for those who have been forced from their homes and their lands at gunpoint. I pray that the refugees will find in You their refuge. I pray also for the friends and the families of those who had the boldness to stay and paid for that choice with their lives. I pray that the blood of your saints, that has been watering this land for over a decade, would begin to bear fruit beyond what any could have imagined. Most of all I pray for Your soon return. Come quickly, Lord. Bring a final end to all this horror and torment. BJ – cool analysis is in short supply. Emotive headlines much more common. Thank you. Well put together I like how you get the concept of salt and light so many miss it completely. There is nothing more important then that for our world. 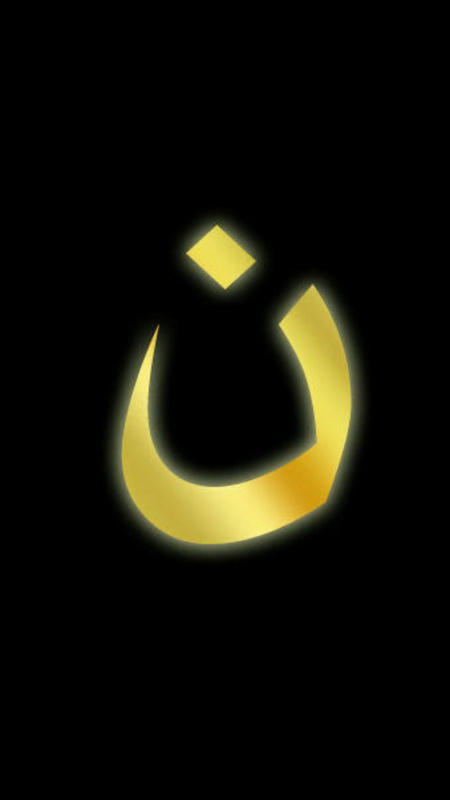 BJ – months ago, when I was still on Facebook, I changed my profile picture to this nun symbol. Then Facebook alerted me that I had to change my password, because someone tried getting into my account from Baghdad. Well said, as followers of the way, we will face prosecution but we should not run from it, but embrace it for by doing so we light the way for others. I am pleased to note that you mention the fact that ISIL has (and continues) to murder Muslims as well as Christians. This should be a corrective to much distorted thinking in the West that ISIL somehow represents the whole of Islam, which is patently not true. Of course, there is the whole convoluted political dimension in all this, which would not fit neatly into your above article; nevertheless, for many of us the question remains: Who really created ISIS? That they are radical and violent fundamentalists is beyond doubt; however, their sudden rise to terroristic power is an interesting query, to say the least. That is, however, probably another discussion for another time (and, perhaps, in a different forum.) Your article is certainly well-researched and well-written, and I commend you for sharing this much-needed information. My only regret is that you do not mention that the overwhelming majority of Muslims are unquestionably opposed to ISIL, an important fact often overlooked in the non-Muslim world. . . Still, an altogether good blog. God bless you! The sad story bout ISIS is that it would never happen if there were no US aggression in Iraq which devastated the country and the US support for them (together with other rebel groups) in Syria. Also, a close ally to the US is Saudi Arabia, the mother and biggest supporter of all radical muslims. So, when you combine it, it seems that the western world, together with middle eastern allies holds a lot of the responsibility for this hell that region is living in now. While I do agree that the US has done a horrible job in its dealings with the Middle East, I do not agree that they are responsible for ISIS. Each person is responsible for their own actions. If I am a boss and I underpay my employees and treat them poorly, am I responsible for them going out and robbing a bank? I may have made such a decision easier for them, but the decision is still theirs. On a much, much more complex scale, the same is true between the US and ISIS. That is true, people who joined ISIS are responsible for their actions, I just wanted to point out how much the horror which US and allies invasion in Iraq has done contributed to the situation. When you have people who lost their homes, families, perspective, health, etc, because of US invasion, inner wars that followed it, or due to drone bombing, you are practically producing a generation of people whose lives have been destroyed completely, and some of them will logically join radical ideologies that give them identity, meaning, groups support, and, most important, a chance for revenge. Also, Syrian war would be over already if the west didn’t arm the rebels. And a lot of those weapons and rebels joined ISIS. So, I agree, it’s complex, and people in middle east do have their share in the guilt, but so does the west. Should we have allowed Hussein’s genocide against the Kurds to continue? Most of ISIS’s armament came when they took Mosul and the Iraqi army fled leaving everything behind. If anything, we are complicit in that in that we left *too soon* before that newly established army was able to fend for themselves. In many cases those rebels in Syria are the only police force most northern villages have and the strongest opponents against ISIS. Russia backed Assad is killing his own civilians. ISIS is killing civilians. Turkey is killing Syrian civilians. Getting involved has been a mess but not getting involved would have been worse. First of all, the US invasion in Iraq is an act of aggression. Saddam Hussein’s genocide over Kurds was done before that. That was a pure act of aggression exactly like when Germany attacked Poland in WW2. You went there to take oil and remove a powerful political player. If you didn’t come there you wouldn’t ever need to ‘move too soon’. That is an act of aggression and if there would be any decency and fairness in the world, the Bush and his administration would be in jail. Saddam, on other hand, is no angel. He was a dictator like any other. You know who else is a dictator. King Saud, he’s even worse than Saddam was. And yet, Saudi Arabia is an ally to the west. Also, the west claims ‘war on terror’ while supporting groups just alike Al Qaeda. And even with Al Qaeda, CIA trained them to get the Soviets out of the Afghanistan. So, the US is a big problem in the equation, it is no force of good or force of balance, it is the main reason for this mess. The US is manipulated by a clique of people on a pursuit to dominate an entire planet. Until Americans realise that we won’t see an end to this mess in the world stopping soon. I’m not saying Americans are worse than others… Lots of countries would do the same if they could, but it is the US doing this mess right now, and it needs to be stopped. Yes, the invasion of Iraq was wrong. I said that then, I still say it now. But allowing Hussein to remain in power was also wrong. He was constantly, consistently bear baiting anyone and everyone else and needed to go. Your view here is far too simplistic. Yes, the Saudis are funding (both financially, and with manpower and ideology) terrorism worldwide. But they are also a relatively most stable government (dictatorship) in an extremely volatile region. Would toppling them be worse? What would rise in its stead? Yes, the CIA trained and supplied the mujadeen who would eventually become the Taliban. (Not Al Quaeda) At the time they viewed the USSR as the bigger global threat. At the time the USSR *was* the bigger global threat. America has made a lot of mistakes. They have done a lot of stupid things (and you haven’t even begun to scratch the surface on that list) but they usually are being done through ignorance and shortsightedness, not for some nefarious agenda driven by an Illuminati like clique. We are not a good nation, but neither are we the devil incarnate. I never said the US is a devil incarnate… I come from Bosnia and Herzegovina, you may know that we had war here 20 years ago. I know very well what propaganda can do and how powerful it is. Our war was done by elites who fueled the mass. The same works for the US and any other nation in the world. Lots of nations are doing serious crimes, just take a look on Israel and Palestinians, Chinese and Tibet, Russia and Chechnya, Turkey and Kurds… And many, many more. World is a big mess, the US is simply the most powerful so it is able to do more sh*t than others.